When it comes to bidding and winning in an eBay auction, a bunch of software programs and Web sites can help automate your snipe bids. 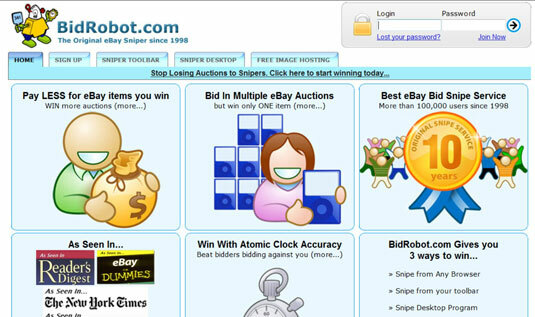 One service to consider is BidRobot, which places sniping bids for you from its servers. BidRobot has won many auctions for people who’ve been on the road or are working. BidRobot is one of the least expensive services out there, charging a low flat rate. You can get a three-week free trial (all you can snipe for three weeks!) at BidRobot. BidRobot also has a BidGroup feature you can use if you’re determined to get the lowest price for an item. You plan a bidding schedule at a set price. The bidding continues until you win your item (or not). Search for your specific item on eBay. You may find a large number of eBay auctions that offer your item. Select the auctions you’d like to bid on. Review the listings and select six different listings. Remember to check the seller’s feedback, description, and PayPal Buyer Protection availability. Create your first snipe by typing your first snipe bid. You type your bid in the pale yellow Bid section at the very top of the BidRobot bid screen. Click as prompted on-screen to indicate that you want to create a group of bids with the other five auctions. To bid on other seller’s auctions, scroll down until you find the Pending Bid Group that contains your first item bid. Use the form in that BidGroup area to add more snipe bids for other auctions in that specific BidGroup. You may add bids for as many additional auctions to this group as you like. If you win any one of the auctions in your BidGroup, the remaining bids in that specific group aren’t placed. This is automatic.